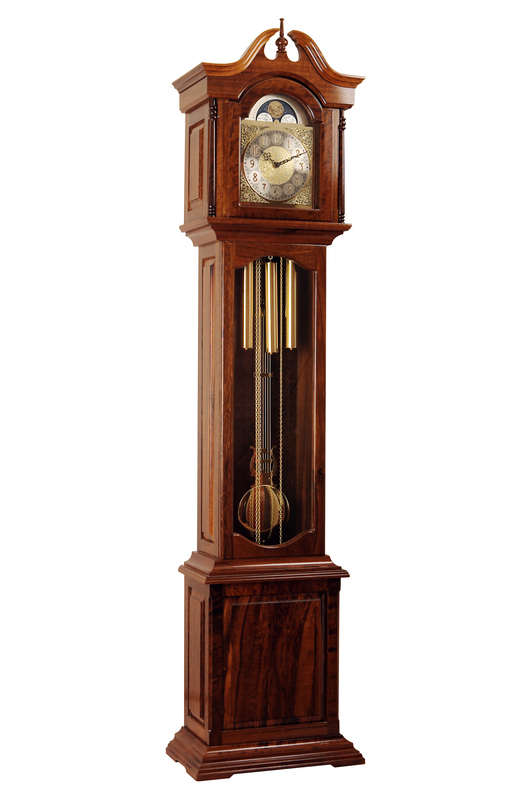 This slim scaled grandfather floor clock, pictured here in Wenge timber, the grain of which is distinctive and highly sought after in African Chic & Renaissance designs, features a swan neck and two columns that adorn the sides of the Arabic numeral moon dial. The Lyre Pendulum is 165mm in diameter. The rails are detailed. The 8-day mechanical Hermle movement plays the Westminster melody and has an automatic night silencer option. Price: ZAR 55 000.00 Incl. VAT; Excl Delivery.